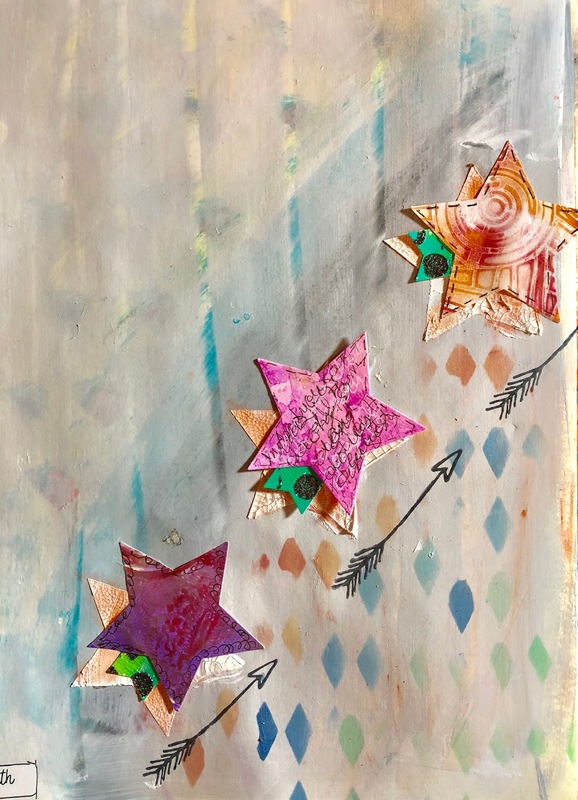 Pink Bunkadoo: Embrace your Art Journal Mistakes, but Get Out the Gesso! 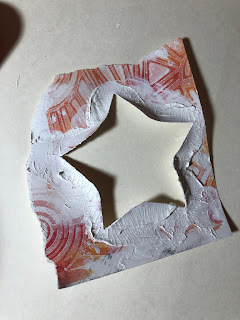 Embrace your Art Journal Mistakes, but Get Out the Gesso! Wouldn't it be so nice to make perfect projects the first time. I truly wouldn't know what that would feel like. I get frustrated by mistakes, but I'm working on living with and learning through them. Plus gesso helps. A lot. I decide to streak wide swaths of paint across my art journal and instantly hated it the moment I finish it because it lacked any subtlety or depth. I added some black gelato underneath, but that didn't help. I stewed for a bit, and then covered the entire page with gesso. The gesso grabbed the gelato and took it for a ride across my page, but I liked it. Then using a palette knife I scrabbed downwards which gave a peek of color and some texture. Now I had something that inspired me, something that I could work with. I wanted to add some crackle paste stars to my page, but I don't have a star stencil. I grabbed a scrap of paper and a star punch and voila! instant stencil! 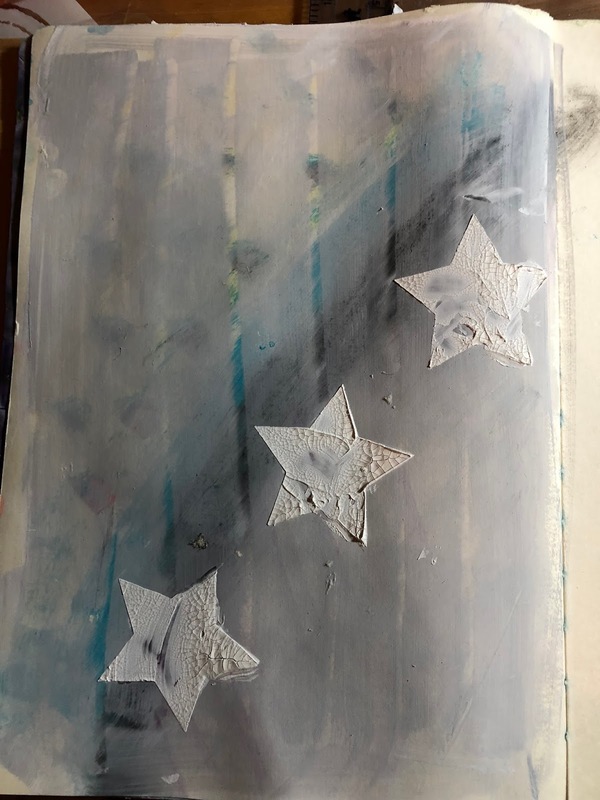 It held up for three stars, but after it dried that was it for my homemade stencil. It still could work for an art journal element on another spread! And I got my crackle paste stars--that makes me happy! When the crackle paste dried, I sprayed orange ink and water letting the orange drip down. That helped to brighten up the page. I used my star punch to punch out 3 stars from my scraps. The middle star is a piece of leftover magicals paper. The outside stars are from monoprinting. To find out more about monoprinting click here. I journeled on the pink star and doodled on the other two. I cut little tails from a mother board I made some time ago. Then gluded the stars slightly offset from the crackle paste stars. To make this page even brighter, I used Distress oxide ink through a harlequin stencil . The stars got a ride on my Flexible Arrow stamp and a word from my Paper Poetry completed this page. So what is our lesson this week? Don't give up on a page you started. Try something. I've used gesso or paint to cover something that wasn't working. I've even comvered a page or card completely with paper. Paper will hide all those crafty disappointments. So don't give up. Not ever! Want to peek at my Etsy shop? Click here! Materials: I'm proud to feature Pink Bunkadoo specialty products. I include Amazon affiliate links to quench your curiousity about a product I use. They are no cost to you and so far no earnings for me.